Lawyers representing students suing the NCAA say the organization is "ducking its responsibilities." 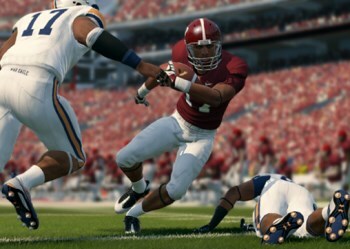 One of the more surprising developments to come out of the gaming industry recently is the announcement that National College Athletic Assocation, or NCAA, has decided not to renew its long running licensing deal with Electronic Arts. Citing the "current business climate and costs of litigation," the organization opted to let the license lapse. The future, in turn, will see more college sports titles from EA, but lacking the NCAA trademark and the brand power it brings with it. This split may be unfortunate for EA but for some it represents progress in the right direction. For instance, there are more than a few inferring that the "costs of litigation" mentioned by the NCAA are likely referring to lawsuits brought against the organization by players unhappy with the group profiting from their likenesses without permission. For those involved in the case, this move by the NCAA is a sign that their efforts are working. "It's apparent to us that the NCAA's decision to end its long and hugely profitable relationship with EA is tied directly to the pressure our litigation is bringing [to] bear," commented Steve Berman, managing partner of Hagens Berman, a legal firm behind one of the lawsuits against the NCAA. Even if the NCAA is starting to sweat, however, its actions don't amount to victory in Berman's eyes. "This announcement makes plain that the NCAA is attempting to mitigate the damage by ducking its responsibilities." In other words, the NCAA dropped the licensing deal hoping to get out of the bills it will have to pay if suits like those being pushed by Hagens Berman are successful. According to Berman, such evasions aren't going to cut it. "The cabal between the NCAA and EA has exploited student athletes for years, using their images in video games without compensation," said Berman. "While we are heartened they've stopped the practice, we believe they owe those student athletes a great deal more than their implied promise to stop stealing their images."